Dash, a year old German Shepherd, has been working on his clove oil Scentwork for just over a month. Take a look at this 4 minute video of dash in a open field doing Scentwork. Watch his head turns which are indications he is picking up the the scent. 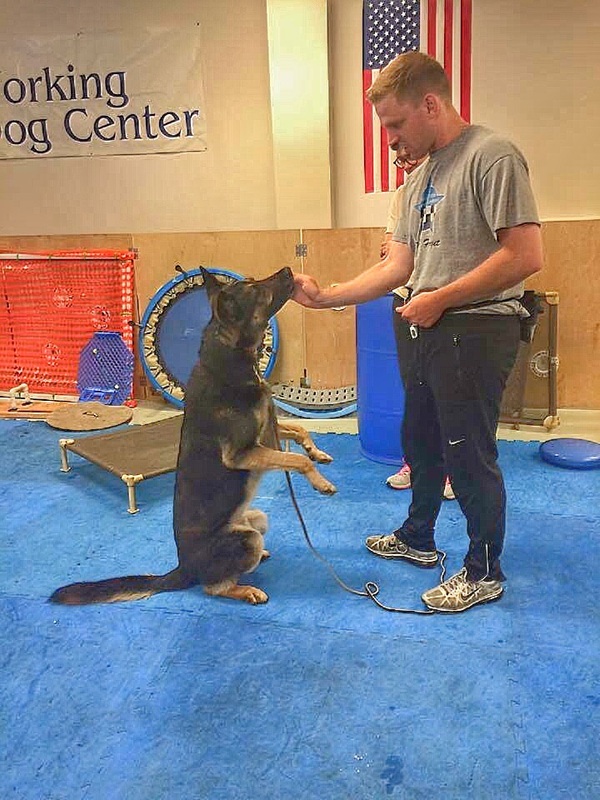 K9 Nosework is the easiest and most fun exercise your dog can do. Your dogs nose is their strongest asset they have. Utilize it and have them work it. 10 minutes of Nosework is equivalent of running for almost 45 minutes. I encourage all dog owners to enroll in a Scentwork class with your dog. Builds companionship, bond, and earns trust with your dog. Call us at 267-685-MAK9 to start your class today!! When we took Ranger into our program, it was known that he had a fear of water. Not much scares him, but water and hoses were not his thing. A little over a week into our program and his is overcome the hose. This was accomplished by first taking his bowl outside, and placing it near the hose. Not ever turning the hose though, we used a water bottle and squirted the water into the bowl. This squirting mimics the intensity of water coming from a hose and into a bowl. And giving him a supply of water that way. Next Step, while squirting the water in the bowl, and ranger loving it, we turned the hose on low and began filling the bowl up. Every time he stuck around and smelled the house and licked the water; we would mark and then reward his behavior. And very quickly he associated the hose as a positive experience, thus making it more likely to occur again in the future. As for swimming, creeks, and shallow waters we used my personal dog Bandit, Ranger's favorite toy kong on a rope, and lots of praise. So I found sometimes a dog learns best by watching another dog do something. So we went for a hike and Ranger watched the intensity of bandit swimming in the creeks and rivers of pennypack park. He gets to see how much fun Bandit is having and wanted to have what he has. The next step was playing tug with his kong along the riverbanks and gradually getting closer and closer to the water. Eventually when his drive and focus is so high that all he cared about is the kong, then we get him to run full speed at us and before he realizes it ranger and I are in the creek. It might last a second or two and he realizes where he is, and run back to shore. However lots of praise and high pitch enthusiastic emotion will let the dog know the immediately preceding the praise was awesome. Ranger retrieving a stick from the Pennypack Creek. 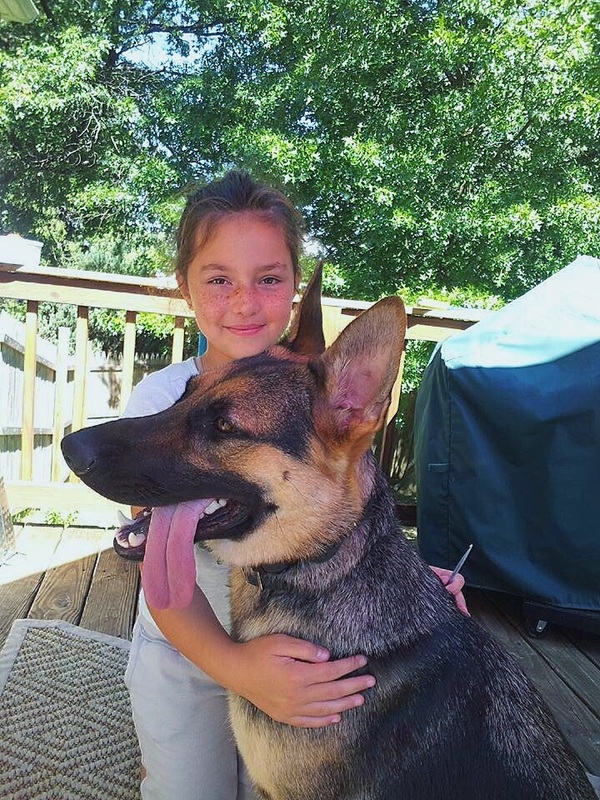 Ranger is a 14 month old German Shepherd. He is our newest project and possibly the next candidate for Police K9 Patrol School. He is still a pup, and yet has an incredible amount of ball drive. His temperament is one to rebound very quickly and overcome fears on the second try. 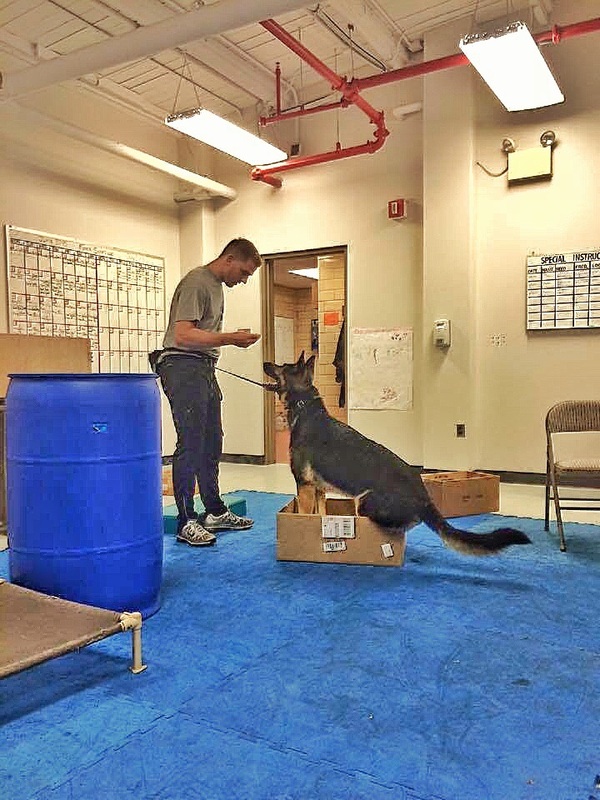 Ranger will work for a ball, a towel, a tug, and has learned to take his treats during marker training very easy from your hand. His obedience is coming along very nicely. We work mostly on environmental and socialization to ensure he is not afraid of any surfaces. Each day Ranger and I work to achieve a different skill or trick. Whether it be simple sit to rolling over. All obedience starts in a distraction free environment. The head tilt will get them every time. It is impossible to not "aww" when the dog gives the tilt of the head. Stay with us as we continue to work and train with our newest project. A special thank you goes out to Joe Nick for the opportunity to evaluate, test, and train this pup in preparation of a wonderful career ahead of him. What a fabulous time we had at the Penn Vet Working Dog Center. Look for future classes at CapableCanine.com. Dr. Cindy Otto is a great instructor. She has a solution for every problem or situation in which a dog may be hesitant to do comply with your verbal commands. She does a great job getting your dog to create the muscle memory before adding a command. Her knowledge, experience, and down to earth personality make her the ideal instructor for almost anyone. Novice to Experienced instructors can learn from her. This was my first time working with Dr. Otto and I strongly suggest any and all dog trainers to at least attend one of her seminars. She addresses dogs training from an angle most owners never think about. Bandit learning to do the Chipmunk. This strengthens the core of a dog. Bandit learning the sit to stand. The blocks are used to keep his front paws in place and work the back legs to push up. Working on Bandits stability and strengthening his front legs. What looks stupid to us can be a good test and challenge for our dogs. I learned something as simple as a box makes a dog use his back back legs. Most dogs don't realize or have their back leg awareness. They can't just walk into the box, they have to consciously lift their back legs one at a time into the box.